JB Kachori Wala ( Jung Bahadur Kachori Wala ) in Chandni Chowk famous for its spicy Kachories established in the year 1971 and introduced the concept of khasta kachori in Delhi. Since then its popularity has been sky rocketing. With more than three decades of experience the Legendry eatery has continued to maintain the taste it has been serving thousands and thousands of food lovers. They serve ‘Urad dal ki kachori’ with Aloo ki Sabzi & kachalu ki chatni and this mysterious ‘chatni’ is what makes this place special and stand out from rest of ‘kachori’ sellers in Chandni Chowk and anywhere else. It has a team of well-trained chefs who are skilled at preparing delicious kachori using unique spices. JB Kachori Wala has developed his own range of spices for using them in the outlet to give excellent and flavorful kachori. The unique spices ensure uniformity and great taste in their products. 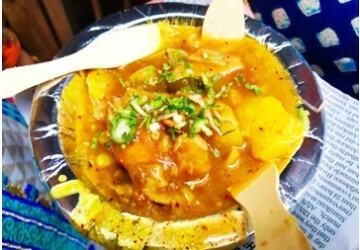 JB Kachori wala was awarded as the best street food of Delhi by Hindustan Times.